Chef Elizabeth J. Tokarczyk received her culinary degree from Le Cordon Bleu, where she received intensive and practical hands on training in classical French Cuisine. Liz began her career in the off premise catering world shortly after graduation at Limelight Catering. 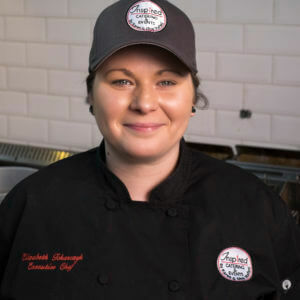 During her tenure at Limelight, Liz quickly worked her way up the corporate kitchen ladder until she was the Head Chef and solely responsible for creative menu development and Kitchen Management.